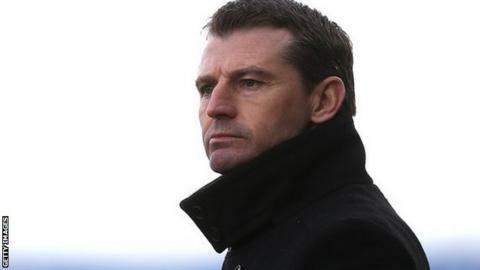 Manager Colin Cooper says Hartlepool United need to "get back to basics" to halt their five-match losing streak in League Two. Pools lie three points above the drop zone after Saturday's 2-1 defeat by Chesterfield, but have a superior goal difference to the teams below them. "The last four games are about having a positive mental attitude and doing the basics," Cooper told BBC Tees. "If we do the basics right, we'll create something." Four games of the season remain for Cooper's side, who before the slump sat in a comfortable 10th place and were 11 points clear of danger. Now in 18th, Pools are still likely to escape with five other sides battling against relegation, but Cooper wants his side to take hold of their own fate. "To make sure people don't get twitchy and jittery we need to get three or four points quickly," he added. "We need as many people at Burton next week with big hearts and big minds and it's the same for the game at Morecambe on the Monday. "If we don't get the points, it's going to take a strong mental approach to get through the last three weeks."